Posted on December 1, 2016 by Diana L.
It’s that time of year again where I break out my recipe books and plan which Christmas cookies I’m going to share with friends and family at my annual Christmas Cookie Party. Each year I struggle with baking my favorite Christmas cookies and sampling some new recipes. My family is never any help at all either as each member always tells me their top 2-3 cookies “I just HAVE to make”. I covered most of my family’s favorite Christmas Cookies when I had a Christmas Cookie Countdown and shared my 12 Days of Easy Christmas Cookies. When asked if I should make the whipped shortbread cookies or the cookie cutter shortbread cookies, the response is always “BOTH”. I really just need to come realize I’m wasting my breath and just add them both to my baking list. Back to my annual Christmas Cookie Party. I usually start planning for my party back in September. Yes. I’m THAT person. I like to plan to have everyone over exactly one month before Christmas which is usually the closest weekend to November 24th. My theory is people are just getting into the holiday spirit and their schedules are not so jammed packed that they will still have time to come for a visit. Besides, they leave with full bellies and home made cookies. My logic is flawless. So let’s get started. I’ll start by mentioning, I make all my Christmas cookies for the Christmas Cookie Party in advance and freeze them until the day of the party. If you have more time available the day or two before the party, baking the cookies right before the party is a lovely option too. However, for sanity sake, I can’t bake, work and clean my house all within a 48 hour time period so I concede to making my cookies during the weeks leading up to the party a few batches at a time and freezing them. 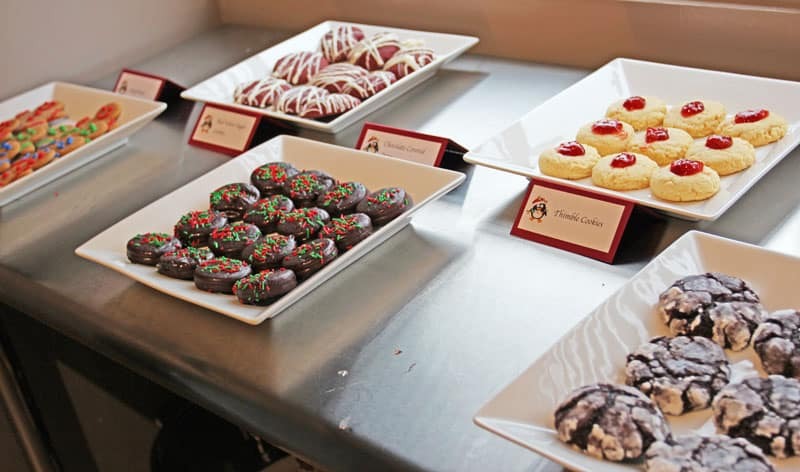 As mentioned before, pick a date and time that is convenient for you as the host(ess) and when you think your friends and family will be available for your Christmas Cookie Party. Be aware of other obligations they may have and take that into consideration. Shopping for Christmas gifts, company Christmas parties, people traveling out of town… people are very busy for the holidays. I like to create a Facebook Event to invite people. It’s an easy way to letting people know the event is coming up so they can mark their calendars and if you don’t seem to have a response from people, you can reach out to them by phone, email, etc to make sure they got the invite. Don’t depend the invitation to arrive through their Facebook account. I would still follow up with a phone call. I usually create the event early and set it up with all the photos and details that way when I’m ready to start inviting people, everything is ready to go. I also send an invitation out to my hubby when I create the event so I can add him as administrator so he can invite any friends or family I may miss. Get things done in the morning before people arrive and the evening to recover. People don’t always stay the entire time but this time gives everyone a wide time frame to stop by. If you have mostly adults coming, an after dinner event would also be fun. This may be one of my favorite parts of the planning process. While I have my go-to recipes, I also like to try new things. Like last year, I discovered these Macintosh Toffee Chocolate Chip Cookies. My husband loves Macintosh Toffee so decided to give them a go. Well wouldn’t you know it, they were the favorite cookie at the party. This year, I’ve got my eye on some Mayan chocolate sparkle cookies I’d like to try. I’m also going to expand and make some chocolate bark and maybe even some Christmas truffles. I like to print out a copy of each of the recipes. I know, I should save a tree but I’m very much a paper and pen person and this helps. I figure out how many cookies each recipe makes and decide if I only need to make one batch or two (or more) based on the number of people coming to the party. If you only plan on making a few varieties, you may want to make more then one batch. Also take into consideration if you are going to need cookies after your party. Once you have an idea of the recipes you are going to make and how many batches, you can make a shopping list. Even if you’re not going to go shopping for the ingredients yet, you will have an idea of what you need and watch for sales. I found butter on sale a month ago for $2.45 a lb. That is an incredible price so I bought the 8 lbs of butter I need for my Christmas cookies. I created a shopping list template to help me track how much I needed of each ingredient. For example – brown sugar. If I need ½ cup for one recipe, 1 cup in another recipe, etc. by the time I went through all my recipes I figured out that I need at least 7 cups of brown sugar and I buy accordingly. This allows me to shop in bulk if it’s justified or to save my money and only buy my ½ cup of shredded coconut at the local bulk store instead of spending money on a full bag that will most likely only go bad in the cupboard. The list can also be divided into different stores. I have a pretty good idea where the cheapest prices are for each item and will make a point of stopping in prior to starting my Christmas baking. This is a great time to purge your freezer. I get to take inventory of all the stuff that is in my freezer, defrost it and give it a good clean and get rid of any UFOs (unidentifiable frozen objects). Over the summer I froze a lot of fresh tomatoes. I decided over the weekend they were taking up way too much space in my freezer so pulled some out to make spaghetti sauce. Planning ahead always saves me from last minute scrambles. I also pull out my freezer containers. Over the past few years, I’ve invested in some good quality Rubbermaid storage containers that stack nicely in my freezer. I have a full size upright freezer which helps me make sure I don’t lose anything. I’ve heard some horror stories about deep freezers. And considering how short I am, I’d be likely to fall in head first if I ever went looking for stuff. Again, I take inventory of my freezer containers, decide if I need to buy more (if it’s in the budget) and maybe decrease how many cookies I plan to make or find alternate options to store my baking in the freezer. Whether you are sending out invitations by creating a Facebook Event, contacting each person individually or sending the owls out to deliver cute little party invitations make sure you give your guests plenty of notice. I tell people about 6 weeks in advance but that’s just because I’m overly excited for my Christmas Cookie Party. Now the big job: baking your cookies. You don’t have to do all your cookies in the same day. Sure, baking them all at once would mean only having to clean your kitchen once but really, you don’t have to be Wonder Woman ALL the time. Divide the process up. Even if it’s one or two recipes a day. This will free up time for the rest of your life to happen. Plan for feeding your family and yourself regular food. Humans can not survive on cookies alone and having some veggies and dip ready in the fridge ensures you have someone to nibble on to keep you going throughout the day. My baking day always ends with us ordering pizza for dinner. Also make sure you start your day off right with a really filling (and easy) breakfast. Ask for help. This does not have to be a one woman or one man show. You know all those friends and family members that will be enjoying your baking? See if any of them would like to help with creating those scrumptious treats. Prepare your working area. Clean your kitchen the night before. Take out your ingredients and do anything and everything you can to get ready.I have a folding table that comes out. I set up my cooking racks on the table so I can spread my cookies out to cool before transferring them into my freezer storage containers. I used to also use a folding table (or my dining room table) covered in thick beach towels so I could put hot cookie sheets straight from the oven onto the table to cool. I will also pull out all cookie sheets and precut parchment paper to fit so they are ready to go the next day. Track down all those kitchen tools you may not commonly use throughout the year: rolling pins ice cream scoops (for scooping cookie dough), cookie cutters, etc. Yes, this is me giving YOU permission to decorate your house early. This was the only way I could convince my husband to let me decorate the house before December 1st. Who can host a Christmas Cookie Party and not have their Christmas decorations up?? So now, the weekend after Halloween, my Halloween decorations come down and my Christmas decorations go up. Yippy!! Depending on how involved you want to get in your decorations, I like to make little labels for each type of cookie I’m making so people can easily identify what kind of cookie they are eating. This also helps for people with allergies. While most of my cookies are peanut and nut free, if your recipes include nuts, you could easily identify this on the label. I also like to make a little fun sign encouraging my guests to fill a take out container (or bag) with cookies to bring home. I personally like to use paper lunch bags and I print out a little message or image (to go with the theme of my party) and paste them onto the outside of the bag. Themes ARE NOT necessary but fun to have. Have fun decorating your house the way you normally would for the holidays. I would take into consideration the number of people coming to the party and maybe limit any large decorations to maximize sitting space. Also watch for cables or long, dangling decorations people (especially children) could trip over or get caught in. I also pull out my “party box” which includes my table clothes, serving dishes and anything extra I use when hosting a party. I share my tips and tricks for frugal party planning here. 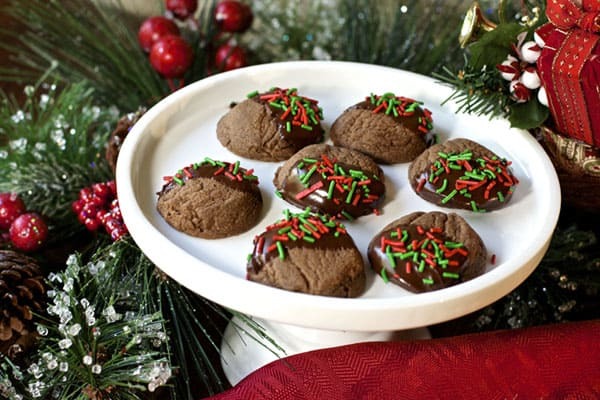 Maybe you want to keep it simple and only offer cookies to your guests at your Christmas Cookie Party. That is completely up to you. I would recommend simple refreshments like coffee, tea, flavoured water and maybe some milk for the kids. I’ll also have some wine and beer for my guests as well as a party punch people can help themselves to. This year I’m considering having a slow cooker hot chocolate available as well! You’ve made it this far!! 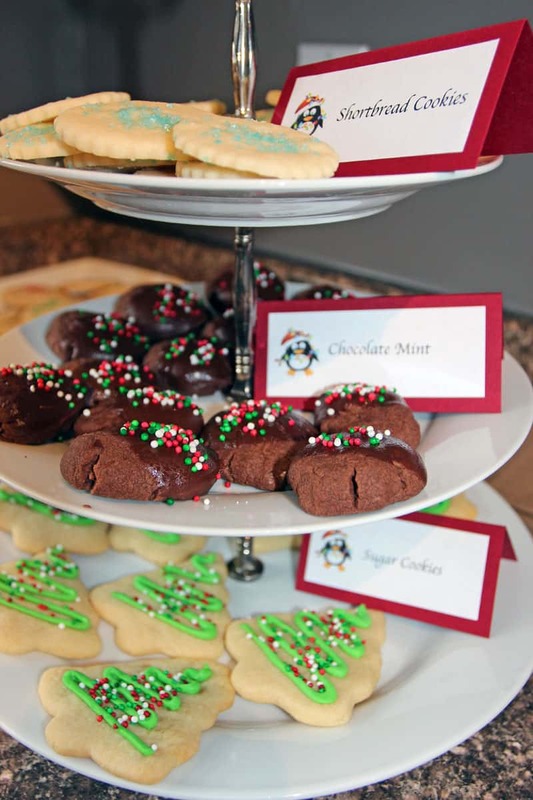 In planning your Christmas Cookie Party and in reading this article. Thank you! The hardest parts are over. My best advice is to think of anything and everything you can do in advance and do it! The day is so much more enjoyable for you when you have the time to visit with your guests and you’re not all frazzled by the last minute scramble. Clean your house from top to bottom. Arrange your furniture for maximum capacity. Tuck extra furniture away in other rooms and pull out folding tables or chairs if you’re going to need them. 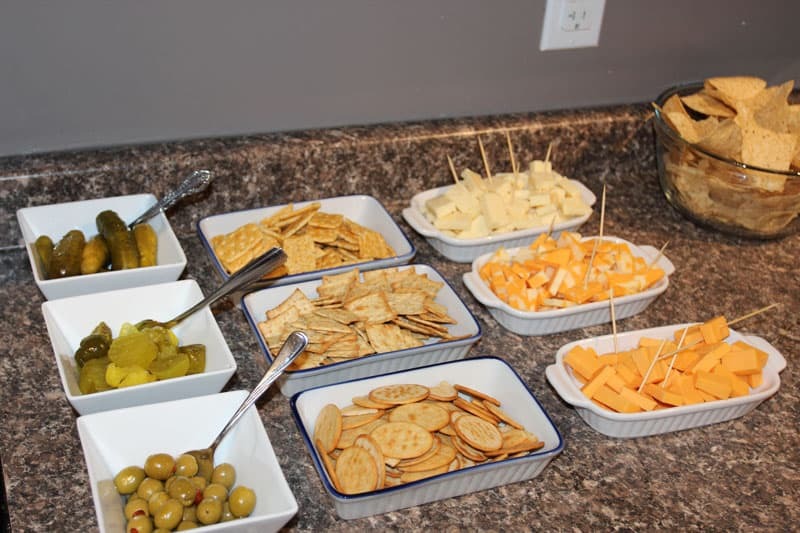 Shop for any last minute appetizers, drinks, plates and cutlery you may need. Set up any tables with table clothes, arrange serving dishes, plates and utensils. Have everything set up so all you need to do is place food on them. Go to bed early. As prepared as you are, you know it’s going to be a long day. Pull your cookies from the freezer and arrange them on their serving plates. Get yourself ready and try to enjoy your party! Phew!! Now that all that is out of the way, let’s talk cookies. If you don’t already have the recipes picked out for your party, might I make a few suggestions? 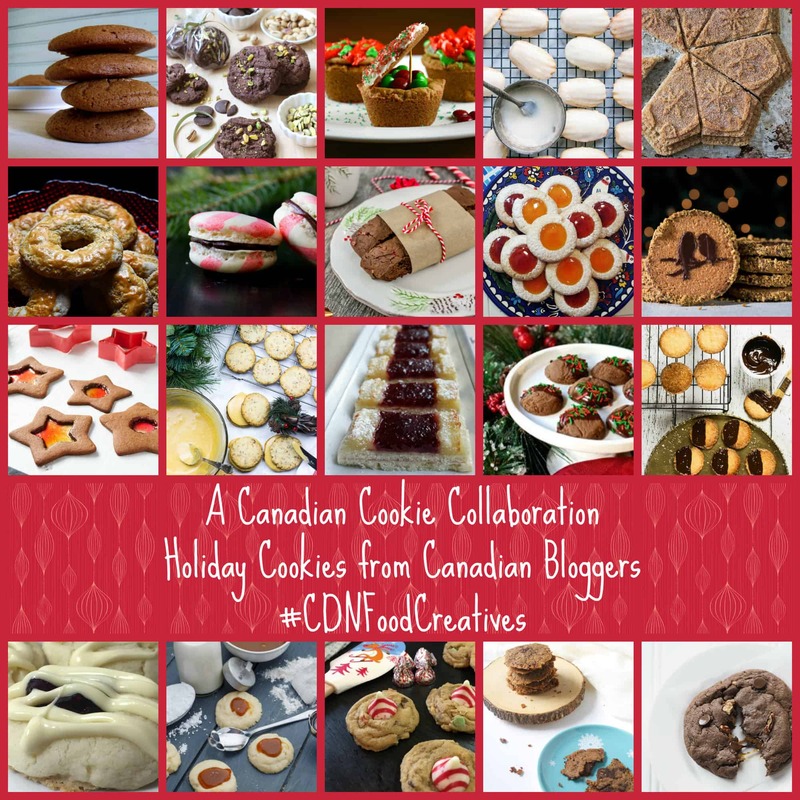 A group of fantastic Canadian Food Bloggers (#CDNFoodCreatives) all got together for the holiday season and put together this amazing list of Christmas Cookies just for you! I have to send a BIG shout out to Laura from The Blue Nose Baker who was the lead on this collaboration. She put a lot of time and effort into rounding all of us up and keeping it all together. Amazing!! My contribution to the list was my favourite Christmas Cookie. It’s a fudgey chocolate cookie dipped in minty chocolate decorated with fun Christmas sprinkles. It doesn’t get any better then this. Beat the butter, cocoa powder, confectioners’, salt, vanilla and flour together on medium speed until a soft, smooth dough forms. Shape the dough into a disk, wrap in plastic wrap and chill 30 minutes or overnight. Preheat the oven to 350°F. Line two baking sheets with parchment paper. Scoop rounded teaspoonfuls of the dough and shape into balls. Place 2 inches apart and cook 8 – 10 minutes. Cool cookies on wire racks. Once cooled melt the remaining 3/4 cup mint chocolate chips in microwave and whisk until smooth. Dip the cookies halfway and place on parchment. 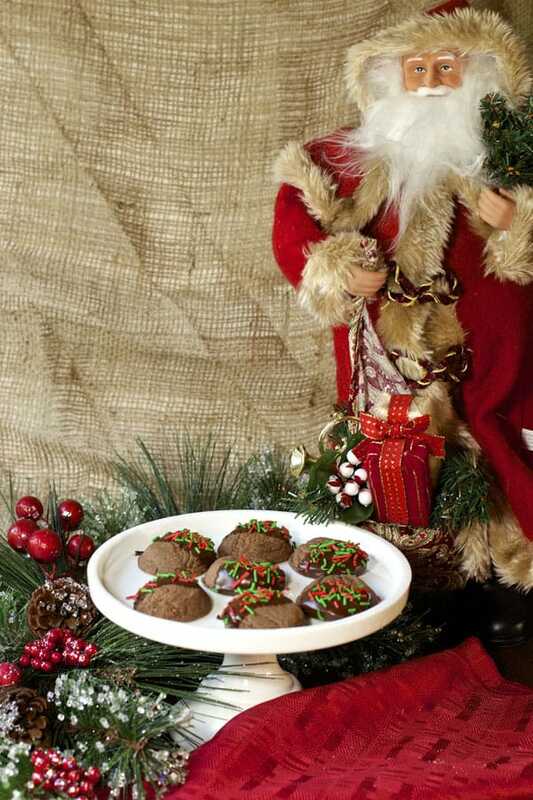 So many great ideas for a cookie party! And I’m with you, if possible I try to freeze as many things as I can before a party, it’s just so much easier! And your recipe looks so good, I love mint and chocolate! Happy holidays! Well isn’t this just the most helpful post! Your addition to the CFC Cookie Exchange is my favourite of the bunch (sshhh.. 😉 ) as I am obsessed with the flavor combo of chocolate and mint! Thanks Amanda. Our little secret. 😉 lol… I love the flavor combo too. Thanks for stopping by!! Ain’t no party like a cookie party! What a fun and lovely idea Diana! I also love these Double Chocolate Mint Cookies. I adore chocolate and when paired with mint it makes it perfectly acceptable for me to stuff my face with as much chocolate as possible over the holidays. Plus sprinkles. Wow! You’re an event planning goddess! I so admire the work that goes into holiday cookie planning. Making several small batch cookies takes time and organization. Good on ya. This is a great post. Oh, and chocolate and mint…yeah. LOL.. I LOVE to entertain. I can’t wait to try some of these delicious cookies from the collaboration! Thanks for stopping by Kacey! Very cool post with amazing tips on plannig a cookie baking party! I have one but we are just 2 this year. We were 3 last year but no 3 was a nussance lol. And love the 2x choco mint cookies too! Thanks! 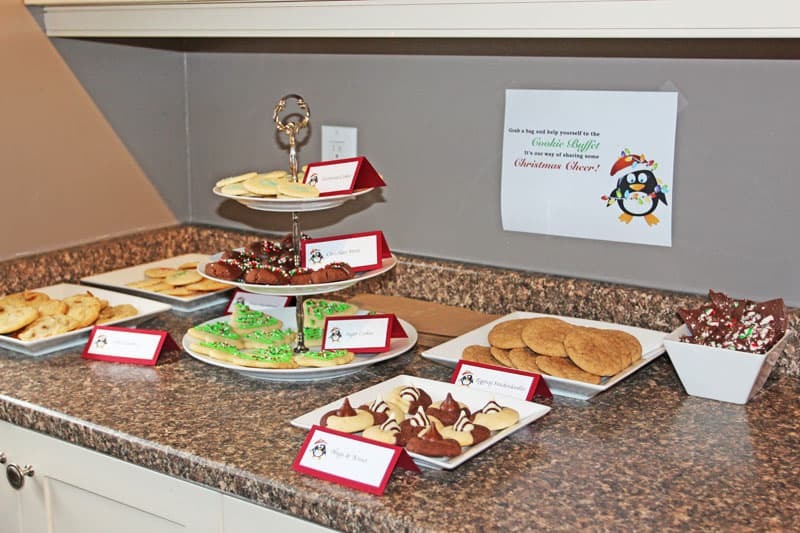 I love hosting a party and well… can’t beat a cookie party! Thanks for stopping by. This is such a helpful plan! I do love that the third step is to clean out your freezer and rescue those lost containers. Those cookies look to die for! Love your cookies ! And great tips on organizing a party ! My daughter and I tend to eat too many cookies on baking days too, so it was a great tip to have a filling and healthy breakfast ! Thanks for sharing !